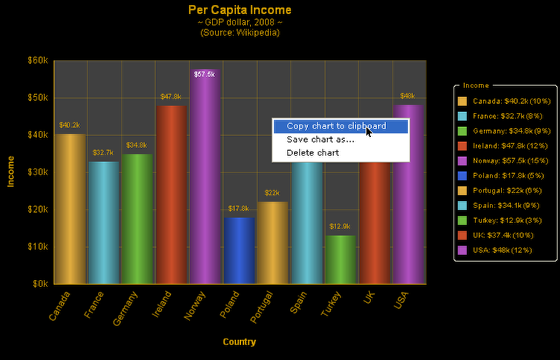 In this lesson you will learn how to quickly create a chart using the ChartMaker wizard. 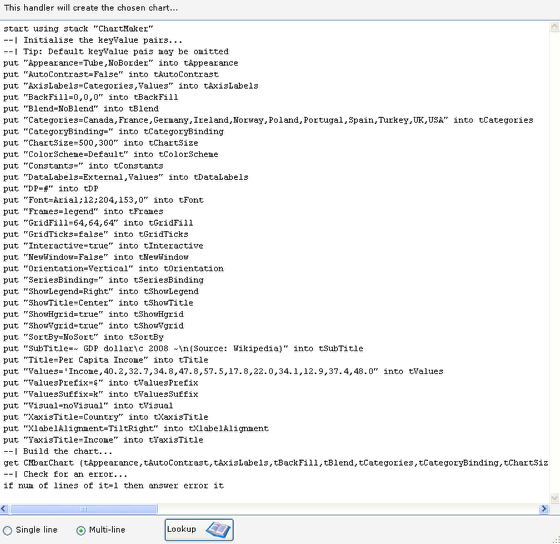 Place ChartMaker.rev (the library) and ChartMaker Utility.rev (the wizard) in your plugins folder as shown above. This will make them available from Revolution's plugins menu for easy access. Optional: Place the Playground stacks in the plugins folder as well. To 'hide' them from the plugins menu, put them in a folder then move them out again when you want them. Alternatively, keep the Playground stacks somewhere you can find them later and use File:Open to access them. 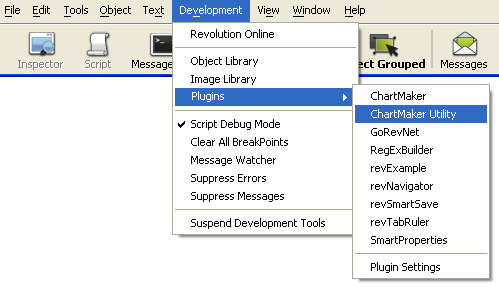 If Revolution is running you may have to re-start it to update the Development:Plugins menu shown above. Choose a sample from the Charts dropdown menu. The sample data and setting are automatically loaded for you. Just click Build chart. 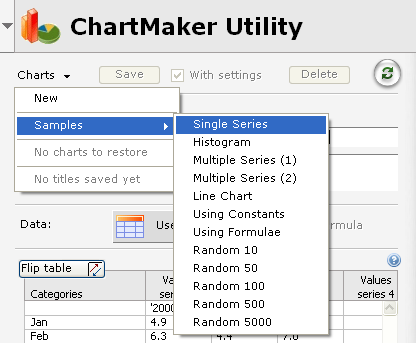 ChartMaker Utility will take the data and apply the settings to draw the chart in the first available toplevel window. 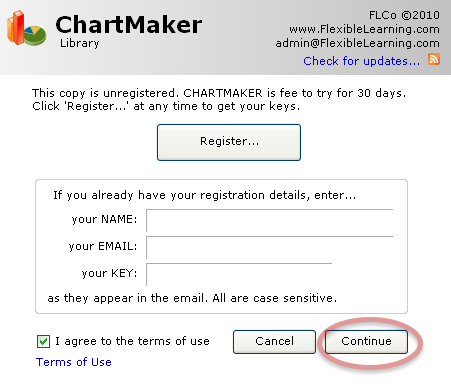 Note that ChartMaker Utility uses the ChartMaker library in the background to create your charts so anything it can do, you can do as well and more besides. You will be prompted for your registration details. If you have them, enter them to avoid the reminder in future. Otherwise you have 30 days to continue and trial the product. 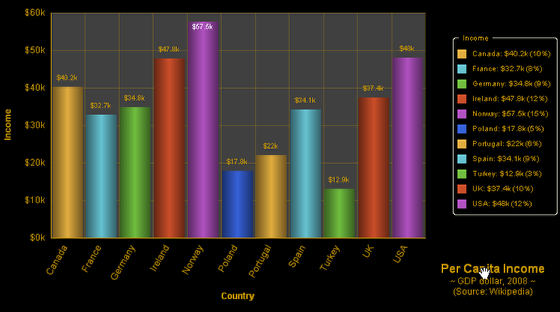 This is the chart you get if you selected the Single Series sample at the beginning. To change the chart's appearance (pie, bar, column, background color, font, layout etc), simply choose different settings in the wizard and click Build chart again. Each time you build the chart, the old chart will be replaced with the new one until the chart's title is changed. Try this: Choose different settings and click Build chart to see the range of options available to you. 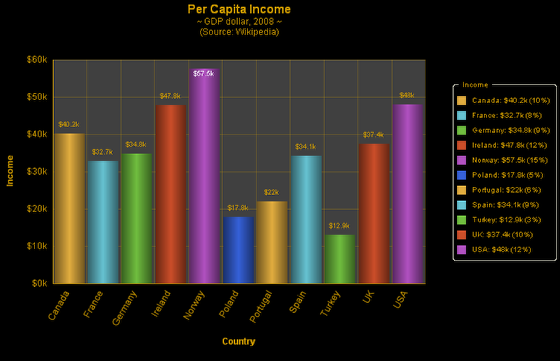 Try this: Choose a different sample, or try applying your own data, to build a different chart. Use the In new Window check-box to always draw the chart is a brand new window. Use the Interactive check-box to enable right-clicking in the chart and dragging elements around to fine-tune their position if you wish. Use the Show syntax button to generate the required script for the chosen chart. Try this: Right-click to show a contextual menu. Try this: Click and drag any element to re-position it. This you can select, copy and paste into your own work. There are two script options you can choose: A single line or a multi-line version. The choice is one of preference only. The multi-line option is the easiest to learn how the syntax works by inspection. Use the Lookup button at any time to open the built-in documentation and see how you can create charts without the utility wizard. Open any of the unlocked Playground stacks that accompany the download. Each is at a different level of scripting difficulty from basic to advanced. To unlock the real power of the library, open the built-in documentation for a complete syntax dictionary with examples, as well as tips and questions answered.